An architect, of course. So a general Google search didn’t reveal much besides being listed with the AIA. The next stop is the New York Times obituaries where we get a bit more info. It would appear he spent most of his career with G&B. 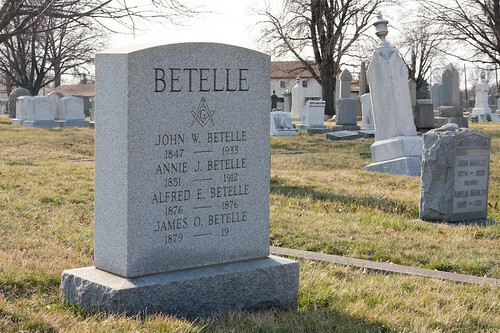 Attributing him to having designed the Betelle structures mentioned is probably a bit loose with the facts—a team of people would have designed those structures—but it does give us one more concrete link to the people who worked with Betelle. Beyond architecture, James Betelle occasionally wrote about grander social issues. This article was written in 1917, shortly after the U.S.’s entry into World War I. Transcribed from The American Architect, Vol. CXII, August 22, 1917, No. 2174. During the past three years the United States in its various governmental departments has been a careful observer of the experiences of the other countries engaged in war, with a view to profiting by the lessons taught. An interesting study of conditions as at present existing in Canada, and which will undoubtedly be duplicated in this country at a later period when our military operations develop, is that of the reeducation of the disabled soldier. Many men invalided home to Canada have been found upon discharge from the hospital to have become incapacitated from the pursuit of their former line of work. For this reason they have been forced through necessity to accept work at a reduced rate of wages, and in many instances have become a charge on the Dominion. 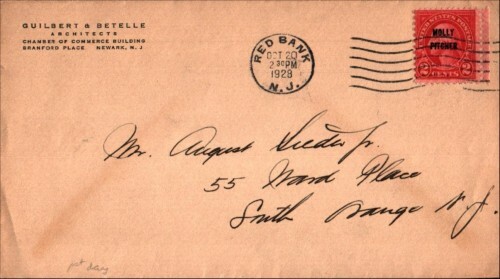 James Betelle’s death is one of the more curious aspects of his story. He died in Italy, ending up in an unmarked pauper’s grave, while in Delaware, a stone with his name on it sits quietly in an old cemetery. How did he come to be buried (as it were), in two places? I’ve already known from his will he desired to be buried at his family plot in Wilmington, the stone being evidence of that. And yet, upon his death in Florence on June 3rd, 1954, he was buried there, and not returned to the U.S. per his request. Why? Few men in the last generation have left a more enduring mark upon this community than one who came here less than a decade ago, and who now has ceased his earthly labors. We refer to Ernest F. Guilbert, appointed supervising architect of Newark’s public schools in 1908. He gave to Newark school buildings a maximum of attractiveness and usefulness for a minimum of cost. He made few errors from the strictly utilitarian or structural sides, and none from the artistic and aesthetic angles. The Newark State Normal School, Central and South Side High Schools, Cleveland and other elementary schools are among the monuments Mr. Guibert has left behind him. His was a rare spirit trammeled in a frail body. He gave to Newark far more than he received from it, although this fact will only become generally appreciate now that he is gone. He was an educator quite as truly as those who deal with textbooks and toil in classrooms; he made the old grim factory-like school construction a dead letter; the old order vanished upon his arrival. So potent have been his teaching that Newark will never again be content with the architectural monstrosities of the past with which it is still scarred; and he did it all in little more than half a dozen years.